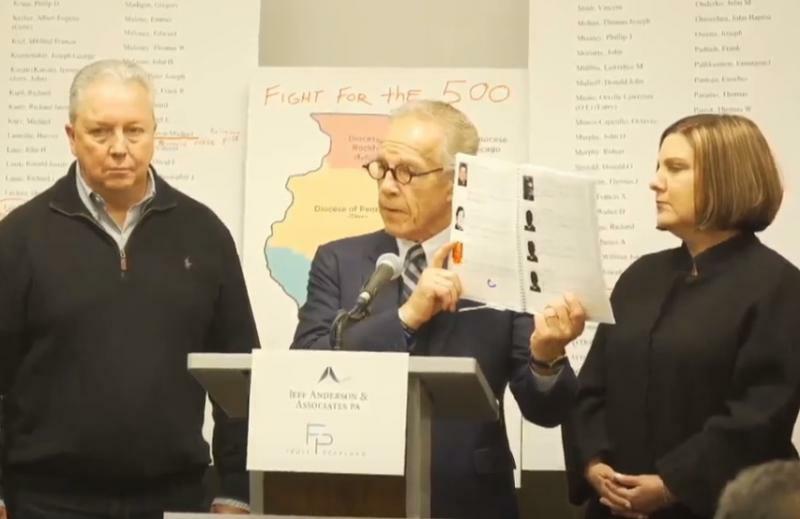 CHICAGO - Advocates for clergy abuse victims say their list of 395 priests or lay people in Illinois who have been publicly accused of sexually abusing children is far more extensive than the names already released by the state's six dioceses. It includes 29 men who served in the Peoria Diosese. Attorneys Jeff Anderson and Marc Pearlman say the disparity shows church leaders continue to conceal the scope of the clergy abuse crisis. But they believe only one priest on the list is still in active ministry. Dioceses throughout the state say they have taken major steps to address clergy abuse, including publishing the names of all credibly accused members of the clergy and reporting every allegation they receive to police. The new list pulls names from lawsuits, news articles and other public sources. A statement from the Peoria Diosese says 26 of the 29 priests named from the region have been listed on its website for some time. Link here to the Andersen Report. Pages 96-105 of the report cover the priest or lay people on the list who served in the Peoria Area. "Fr. Frank Martinez: He is a priest of the Diocese of Davenport, Iowa, and is listed on their diocesan website. The Diocese of Peoria has never received an allegation of abuse regarding Fr. Martinez. Msgr." "Charles Beebe: Jeff Anderson’s report today stated that the Diocese of Peoria only reported this case after a lawsuit was filed. This is completely false. In June 2018, the Diocese of Peoria received an allegation that Msgr. Beebe sexually abused a person in 1981 (37 years ago). Msgr. Beebe was immediately placed on administrative leave and cooperated with the investigation. This allegation was immediately reported to the Peoria Police Department. The police investigated this accusation and reviewed Msgr. Beebe’s personnel file. They concluded their investigation and acknowledged the Diocese’s cooperation in this matter. This allegation was taken to our Diocesan Review Commission. The Commission unanimously determined that the allegation was unsubstantiated and could not be deemed credible. Msgr. Beebe was reinstated in ministry. Msgr. Beebe is a retired priest since 2016. This case has been reported to the appropriate State’s Attorney. All of these actions of the Diocese occurred months before any lawsuit being filed." "Msgr. Thomas Maloney: While Msgr. Maloney was alive, an allegation was received. He was immediately placed on administrative leave. This allegation was taken to the Review Commission and it was unanimously determined to be unsubstantiated. Later after Maloney’s death, the Diocese entered into a settlement agreement. As is often the case with settlements, the Diocese makes no admissions of liability. This case has been reported to the appropriate State’s Attorney. Under the direction of Bishop Jenky, the Catholic Diocese of Peoria remains committed to maintaining a safe environment to all children."